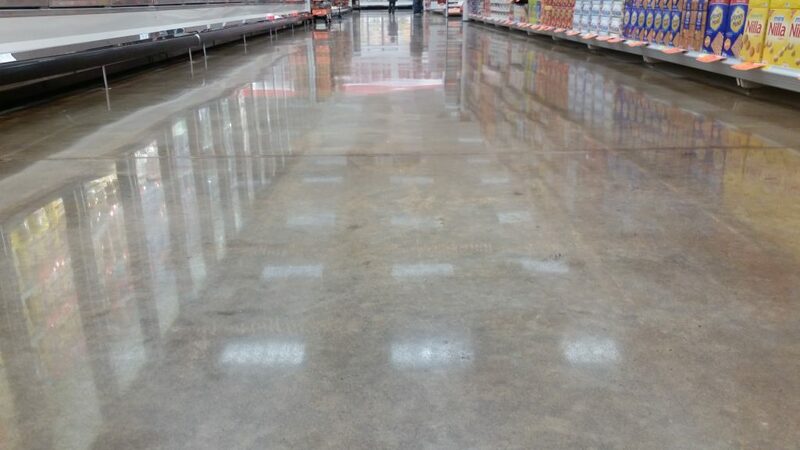 POLISHED CONCRETE – Whitco Flooring, LLC. Polished concrete is a popular and cost-efficient option for industrial and commercial flooring systems. Polished concrete is a great solution for facilities with large open spaces. Whitco flooring can transfer your dull concrete floor into a smooth sleek surface. Polished concrete floors can be decorated, stained, and shined to your preference and needs. Polished concrete resists the marks left by hand trucks and forklifts. Polished concrete is also more resistant to heavy foot traffic commonly associated with institutional, commercial, and retail space. Polished concrete floors are easy to clean, requiring only a moist mop to remove unwanted debris. The polished surface also eliminates the need for applying costly coatings or waxes. Helps resist staining from oil, chemicals, and other unwanted spills that commonly occur in industrial environments. The experts at Whitco can design your floor with the amount of sheen you desire! Whitco offers a variety of finishes such as matte or a highly polished finish that is nearly mirror like in appearance. For additional information: Please contact the flooring experts at Whitco today! We can personalize solutions to best meet your facilities needs.